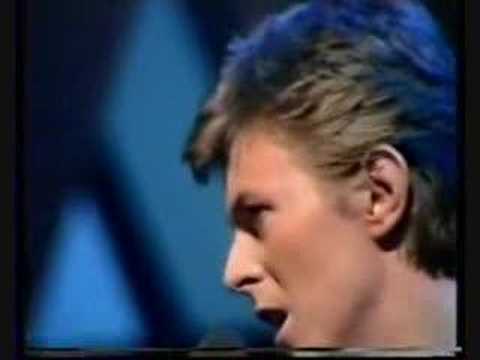 David Bowie's brilliant piece, "Heroes" may have been the song that really got me to sit down and listen to an entire album (and then subsequently buy his entire catalog!). There isn't a whole lot of earth-shattering trivia about this song. Although since I'm a huge King Crimson fan, I feel compelled to point out that "Heroes" was co-written by Brian Eno. Eno played synth on the track, and fellow King Crimson-er, Robert Fripp, played the guitar track. "I'll never forget that. It was one of the most emotional performances I've ever done. I was in tears. They'd backed up the stage to the wall itself so that the wall was acting as our backdrop. We kind of heard that a few of the East Berliners might actually get the chance to hear the thing, but we didn't realize in what numbers they would. And there were thousands on the other side that had come close to the wall. So it was like a double concert where the wall was the division. And we would hear them cheering and singing along from the other side. God, even now I get choked up. It was breaking my heart. I'd never done anything like that in my life, and I guess I never will again. When we did 'Heroes' it really felt anthemic, almost like a prayer. However well we do it these days, it's almost like 'walking through' it compared to that night, because it meant so much more. That's the town (Berlin) where it was written, and that's the particular situation that it was written about. It was just extraordinary. We did it in Berlin last year as well – 'Heroes' – and there's no other city I can do that song in now that comes close to how it's received. This time, what was so fantastic is that the audience – it was the Max Schmeling Hall, which holds about 10-15,000 – half the audience had been in East Berlin that time way before. So now I was face-to-face with the people I had been singing it to all those years ago. And we were all singing it together. Again, it was powerful. Things like that really give you a sense of what performance can do. They happen so rarely at that kind of magnitude. Most nights I find very enjoyable. These days, I really enjoy performing. But something like that doesn't come along very often, and when it does, you kind of think, 'Well, if I never do anything again, it won't matter.'" I love that song I can play it in the guitar. Thank you very much.